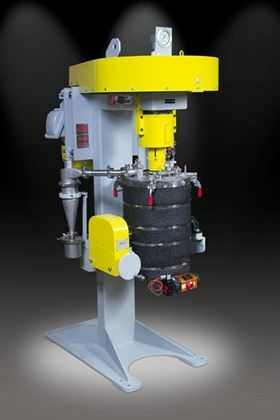 Union Process has developed a pilot-sized mill for cryogenic grinding. Union Process, which makes particle size reduction and dispersing equipment, has developed a pilot-sized mill for cryogenic grinding with a stainless steel insulated cryogenic milling chamber. The mill features a cryogenic controller with temperature probe to help maintain a consistent liquid nitrogen level in the milling chamber. It has a cryogenic cover with vent and a phase separator, along with two charging ports, along with an actuated ball valve assembly that enables remote discharge of the liquid nitrogen slurry. Featuring a 10 HP explosion-proof motor and electricals, the mill also has a variable frequency drive to control agitator speed. The drive displays Hz, RPM and HP. An operator station is mounted on the unit with start/stop push buttons and a speed potentiometer.